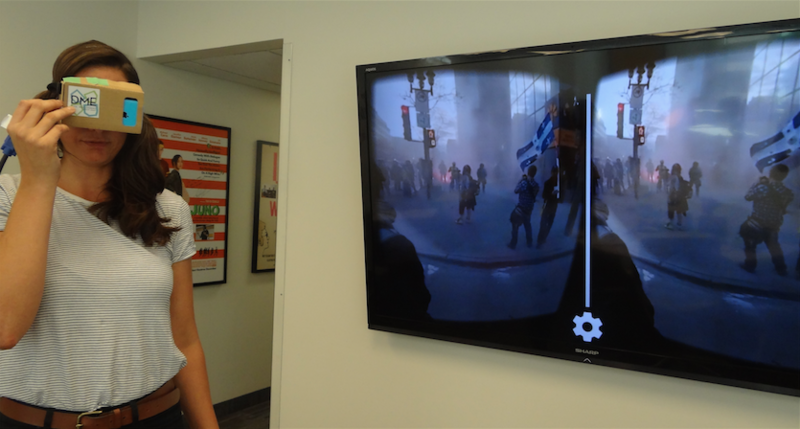 Canadian Press photo editor Marie-Espérance Cerda was in the midst of this year’s violent May Day protests in Montreal and her virtual reality coverage of the event allows audiences to share in the experience. Cerda’s experiment in virtual reality journalism plunges the user into a three-dimensional world, entirely filling the user’s field of view with 360 degrees of video that shifts with the gaze of the viewer. Her project also pairs this video with real-time audio from the scene, completing the immersive experience. “With virtual reality you are no longer representing reality or an event, you are recreating an experience. You are trying to get someone to feel something,” said Cerda, who produced the immersive journalism experiment as the major project for her master’s in media production degree at Ryerson University. Gene Allen, a professor at the Ryerson School of Journalism and the supervisor of Cerda’s work, praised the innovative nature of the project: “[It] allows viewers to focus on any aspect of the unfolding action, just as if they were there. Cerda said her interest in technology and its function in journalism led her to explore the relatively new concept of virtual reality as a journalistic medium. She is not, however, the first to experiment with the tools. American journalist Nonny de la Peña, “the godmother of virtual reality,” pioneered the use of immersive technology in reporting. Her latest piece, Project Syria, commissioned by the World Economic Forum, simulates the bombing of a Syrian refugee camp. Each element of the film is drawn from real audio, video and photographs taken on scene. Similarly, The Wall Street Journal took its readers on a roller coaster ride of the NASDAQ, while VICE News asked, “what if, instead of watching a news broadcast about the latest protest, you could walk into it?” when it created VICE News VR: Millions March. It places the viewer in the midst of 60,000 protesters on the streets of New York City. “I saw huge potential. I wanted to do the same thing and see what the implications of that would be,” Cerda said. Intrigued by the work of those before her, Cerda began creating her own piece of immersive journalism. To capture all 360 degrees of the Montreal riot, she walked the streets of Montreal with six GoPro cameras set into a 3D printed rig: the result is what looks like a baseball bristling with cameras pointing in six different directions. The next steps involved asking Ryerson to purchase a computer program called VideoStitch and teaming up with an undergrad student to plug all the audio and visuals into a 3D content development software called Unity. While Cerda’s video can also be watched in a two-dimensional interactive 360 degree video, it becomes immersive when viewed through the lens of Google Cardboard, a low-tech virtual reality viewing headset that attaches to a smartphone. The headset, made of folded cardboard, two biconvex lenses, magnets, velcro and a rubber band, is available for around $20 from Google Cardboard. Users can also build their own Google Cardboard at home using Google’s free instructions, with the lenses available online and other materials available at home or at a hardware store. Cerda said one of the drawbacks with the new medium is that it cannot be edited like reels of traditional footage and will likely not be successful with all news audiences. In her research, she found younger males were most receptive to the technology, while people over 35 were less interested and more set in their ways in terms of how they received their news. She said producing immersive journalism is also more labour intensive and technologically demanding than current approaches.